My last review was on the Aloe Vera gel that I purchased from Natural Mantra from the brand Rustic Art. 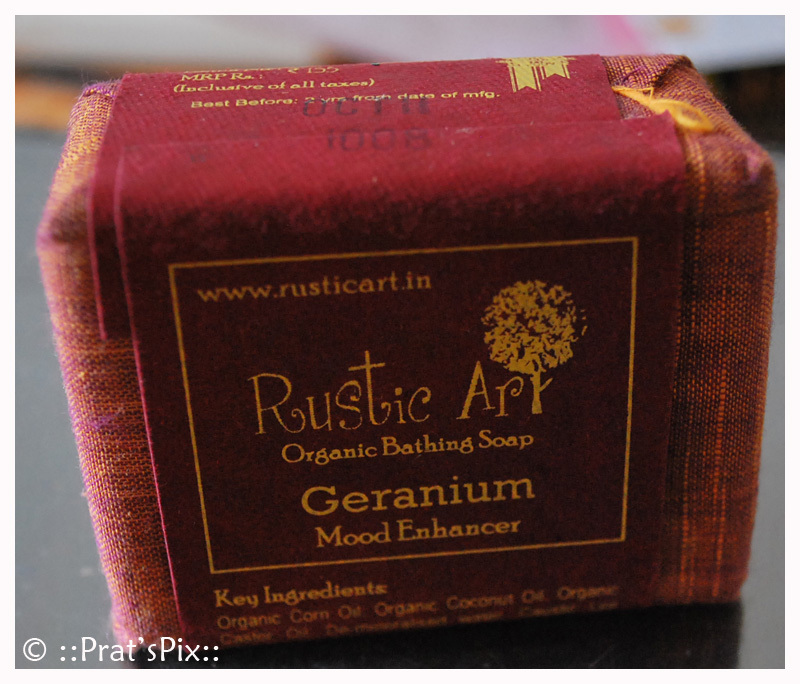 Today I am reviewing yet another product of Rustic Art, the Geranium – Mood Enhancer Soap which was also bought from NM. I must add here that I totally love the packing of the soap. It is a lovely, lovely maroonish-orange colour ( incidentally one of my fav colours) and it is packed in a cloth. The fragrance of the soap is really mild which I like. It has a faint fragrance of the rose. I do not like strong fragrances. Once you’ve bathed with it, the fragrance still lingers, one factor which I like! I wish the soap would have been the same colour as the packaging. It is an off-white coloured soap when you open the packaging. Now one thing that I want to add here is that in one of my previous posts, Sunita Jaju from Rustic Art mentioned the right way to use the Rustic Art soaps to make them last longer. I would like to share the tip with you. The ingredients in the soap are: Organic Corn oil, Organic Coconut Oil. Organic Castor oil, De-mineralised water, Caustic lye Pungama oil, Shea Butter, Aloe Vera essential oils, Fine fragrances of Geranium and Rose. Will I buy this again? : Not until I have tried the other soaps from Rustic Art and zeroed in to a few favourites. Some of the soaps look really awesome, especially the Coffee Soap, the Baby soap and the Demulcent Soap. But I guess next on my list will certainly be the Baby Soap for my boys! Where can I buy this? : Most of the Rustic Art products are available online on Natural Mantra. 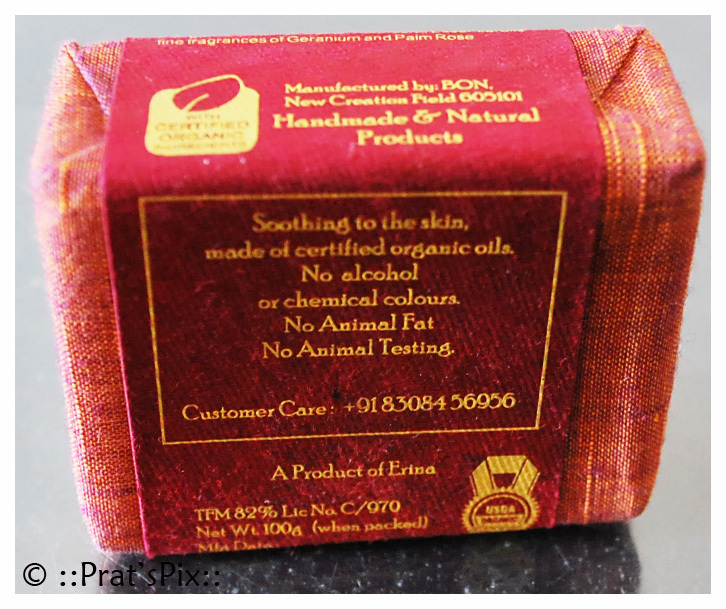 Price and Shelf life: The soap is priced at INR 155 for a 100gm soap bar. It has a shelf life of two years from the date of manufacture. Really? I have just ordered for the Orange Cinnamon Soap, the Exfoliate Soap and the Demulcent Soap from Natural Mantra. Waiting to try them out. Do try soaps from Neev..they are also handmade and the entire venture empowers women (we rock:)).. I have been following your blog for the past 2 months now.. Its wonderful and i find it really helpful.. After reading your reviews i am trying to change my family to using organic products..
One quick question,,, Can these rustic soaps be used on face and body ??? Hi! Thanks for the kind words. Rustic Art soaps can be used on the body for sure, but I am not sure if you can use it on the face. I can get back to you on this after I check with Rustic Art. I can actually go on and on about what you can buy if you have kids! I use the oil too and I typically follow it with the Rustic Art shampoo. It has worked for me so far. I recently tried switching to Dove Elexir and the results were not that great! SoulTree is another good brand and I totally love their shampoo too! Do try the baby soap by rustic art for your son! I am sure he will like it!